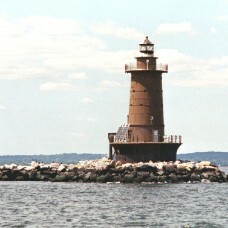 The Sandy Hook Lighthouse [40° 27' 42" N – 74° 00' 06" W] circa 2000. 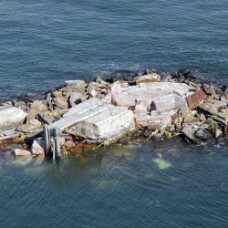 Originally built about 500 feet from the tip of Sandy Hook, NJ, it now stands about 1½ miles from the tip due to the northward expansion of the Hook by ocean currents. 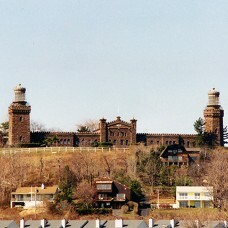 Constructed in 1764, the 103 foot tall octagonal mortar covered stone tower was the fifth lighthouse built in America and is the oldest original structure still functioning as a navigational beacon in the United States. Originally, the light had 48 oil burning copper and glass lanterns. 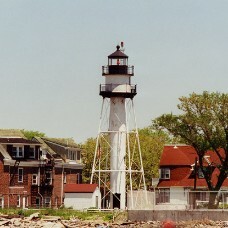 In 1856, the light was upgraded with a third order Fresnel lens and it is still in place today. 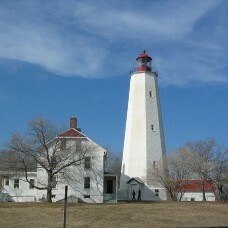 In 1899, the Sandy Hook Lighthouse became the first lighthouse in the country lit by electric lamps. 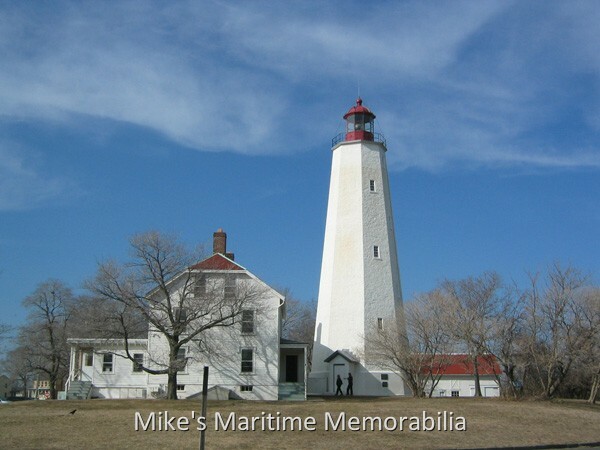 At a ceremony celebrating its 200th anniversary, the lighthouse was dedicated as a National Historic Landmark and is now part of the Gateway National Recreation Area. 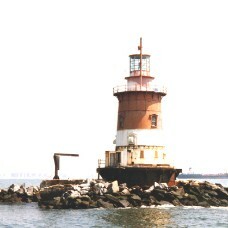 Its silhouette and warm beam of light is a familiar sight to anglers, mariners and travelers passing in and out of New York harbor. The Sandy Hook Lighthouse reopened to the public Sunday, June 24, 2018 after a nine-month renovation that refurbished the interior and exterior of the 254-year-old beacon. It is now open daily to the public with free half hour tower tours running from 1 to 4:30 p.m. Tour groups are kept small due to space constraints inside the tower and tour patrons must be at least 4 feet tall to ascend the tower.